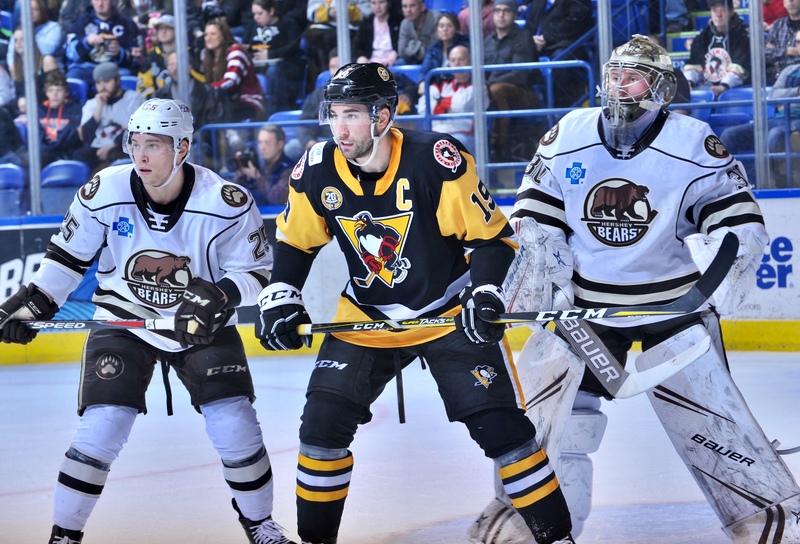 The Hershey Bears beat the Wilkes-Barre/Scranton Penguins 5-1 Friday night at the Mohegan Sun in Wilkes-Barre. The win raises the Bears record to 13-17-0-2 on the season. The Bears three-in-three weekend continues Saturday night when the Bears host the first the Providence Bruins at Giant Center. Puck drop on Saturday is set for 7:00 PM. The Bears struck quickly with goals from Nathan Walker and Grant Besse in the first two minutes of the opening period, giving the Bears a 2-0 lead at the first intermission. The Bears would notch two more tallies in the middle of the second period to make it 4-0, before the Penguins finally got on the scoreboard, making it 4-1 at the second intermission. Garrett Pilon would add to the Bears lead midway through the final frame making it 5-1. Scratches: Riley Barber was a late scratch (illness) and replaced by Brian Pinho on the top line. Lucas Johansen (upper body), Connor Hobbs (upper body), Shane Gersich (upper body), Kris Bindulis (upper body), Mason Mitchell and Tobias Geisser (World Juniors) were the other scratches. The Bears struck quickly in this one. Nathan Walker deflected a shot for the Bears first tally just 16 seconds into the contest. Walker would knock Home a deflected pass from mid-air for the score. Jayson Megna (7) and Juuso Ikonen (6) were credited with the helpers. Then just 1:44 later, Grant Besse would knock one home to give the Bears two quick strikes in the first two minutes. Aaron Ness (15) and Hampus Gustafsson (2) were credited with the assists. The first period would end with the Bears leading 2-0. Shots on goal were 9-8 in favor of the Penguins. The Penguins were 0 for 1 on the power play. The Bears did not have a power play in the first period. The Bears would stretch their lead to 3-0 with a goal from Steve Whitney at 7:13 of the middle frame. Liam O’Brien (4) and Steve Johnson (1) were credited with the helpers. This was Johnson’s first AHL point. Then just 1:04 later, the Bears would make it 4-0 with a goal from Mike Sgarbossa at 8:17, and the boo birds were out at the Mohegan Sun. Nathan Walker (5) and Aaron Ness (16) were credited with the assists. The Penguins would finally get on the scorebaord with a goal from Joseph Cramarossa at 15:37 of the middle frame. The second period would end with the Bears leading 4-1. The Penguins outshot the Bears 8-7 for the middle frame. The Bears were 0 for 2 and the Penguins 0 for 1 on the power play after 40 minutes. The Bears would stretch their lead to 5-1 with a goal from Garrett Pilon at 2:08 of the final frame. Pilon would take the puck the length of the ice, deke to the middle and unleash a filthy snipe for the Bears fifth goal. Colby Williams (9) and Vitek Vanecek (1) were given the assists. And that would be the final. Shots on goal were 6-6 in the final frame. Vitek Vanecek stopped 21 of 22 shots. The Penguins outshot the Bears 23-21. Nathan Walker led the Bears in shots with 5. The Bears were 0 for 2 and the Penguins 0 for 1 on the man advantage. Grant Besse’s 100th professional game, 18th AHL game. This entry was posted in News and tagged Garrett Pilon, Grant Besse, Hershey Bears, Jon Sorensen, Mike Sgarbossa, Nathan Walker, Steve Whitney, Wilkes-Barre/Scanton Penguins, Wilkes-Barre/Scranton. Bookmark the permalink. I do. He’s just 22, and continues to get better. That dirty sequence from Pilon is what I want to see! Dude should be a real NHL threat if he develops well.